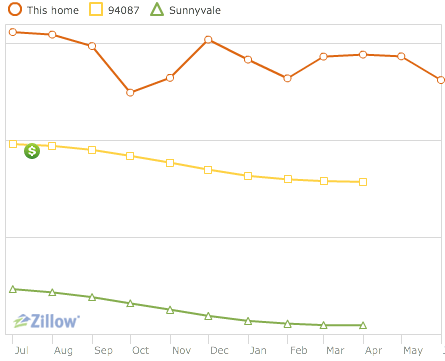 Many people look to Zillow for third party estimates of property values, whether homes are on the market or not. One can turn to Zillow to gain property information on homes, including home features, property tax data, and previous sales. The more data-hungry or curious may even watch their own homes or target properties to see fluctuations, due to a number of factors, and get a good idea of whether homes' prices are rising or declining. Two weeks ago, the company recalibrated its systems, and has pretty much thrown all previous years' data out the window, replacing it with new histories. So if you were using the site to get a good picture of your neighborhood, they're hoping you'll ignore what you already know and start fresh. Coming up on the one year mark in our home which we purchased last summer, I've kept an eye on the surrounding market, both on Zillow and Redfin, to not only watch our own home's data, but seeing new sales come and go. In an economy which is by no means perfect, the weekly data coming from Zillow from its frequent "Zestimates", and tagged on my weekly Mint.com emails was pretty bad all Spring. My email archive shows eight separate consecutive downward revisions of our own home value, shaving off sixty thousand dollars in equity. While I have no intention of moving again any time soon, it was hardly reassuring. 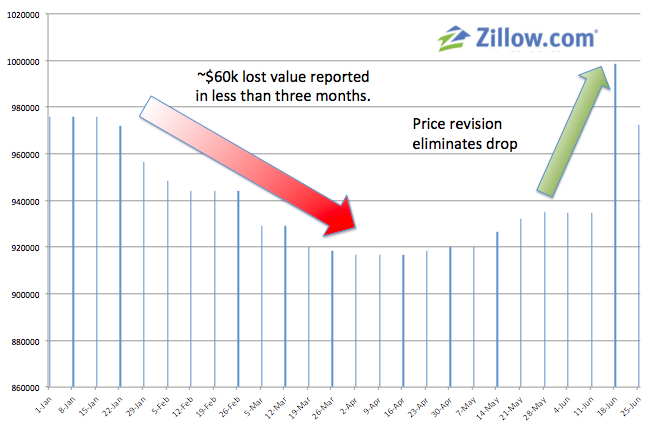 I even complained about the continued drops and negative feedback I saw through Zillow on one of my less-trafficked Twitter accounts, citing the $67k drop of almost 10 percent in just under three months. 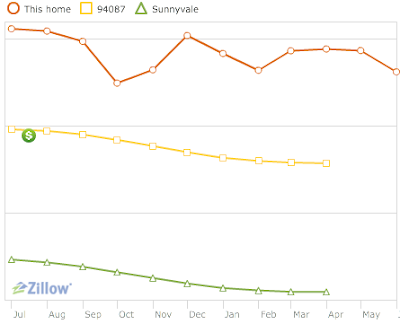 But on June 13th, Zillow wiped the slate clean and the year's data doesn't show such a steep decline after all, showing a comparatively straight line with a near-static value and a minimum of variance. Instead of a sharp downfall I had assumed was true this Spring, the gap between highest Zestimate and lowest is only about $20k, less than a third of the bloodbath I was seeing. Pricing one's home for sale or financing is a delicate one, a dance of recent area sales, market trends, and all manner of comparables. 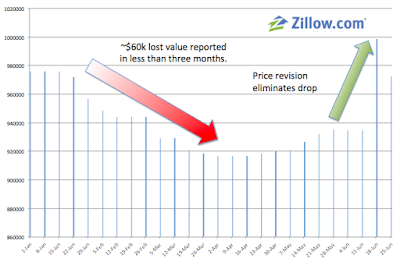 But Zillow's move has me questioning not just our own home's value, and the year's graph, but all estimates I bump into, and of course, their own projections for values in years' past. In an FAQ on Zillow's site related to "Zestimate Improvements", they mention that you "Possibly" could see changes in history, thanks to algorithm edits going back to 2006, arguing for improved "current accuracy" and "historical accuracy" - adding "We are now working on re-doing all the history." It's likely they know what they are doing, and with more data, they were losing confidence in both their current and historical values. But it sure didn't seem like the company was unsure about its competence before the move, and I'm not sure they're confident about their current data any more.